Water is an important resource in many production plants as well as a natural element in the environment. However, it is also an undesirable contaminant when present in lubricating oil or grease. 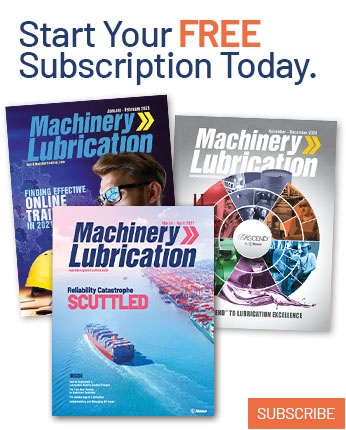 In fact, water is the second most common lubricant contaminant and can cause a significant reduction in the life of machines and components. 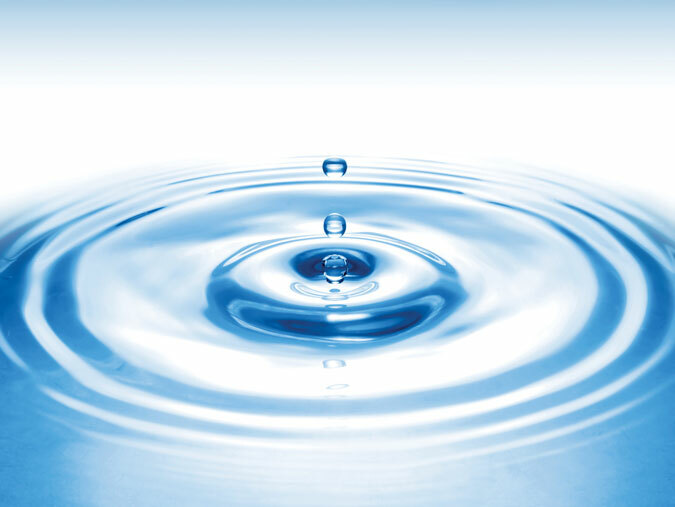 Therefore, it is critical to monitor water contamination to ensure machine reliability. 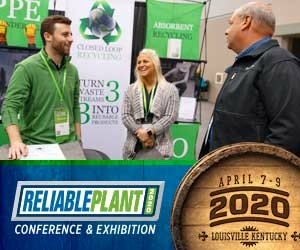 A number of different approaches can be used for monitoring moisture contamination, depending on the machine’s criticality, the risk of failure and the available resources. These methods include laboratory oil analysis, portable field instruments and tests, visual field inspections, and online sensors. Although laboratory oil analysis remains the most frequently used method of monitoring water contamination, it doesn’t necessarily represent the most effective approach in terms of early failure detection. With this method, oil samples are taken and shipped to an external laboratory to perform an agreed-upon test slate. This may also include an occasional or exceptional sample of new or used oil being sent to the lab for a specific purpose, such as quality control of the incoming lubricant or when an issue is suspected. While this approach is useful, the time from when the sample is taken until the report is read can be a limitation, especially if an abnormal condition is present. Among the technologies that laboratories employ to monitor moisture include Karl Fischer titration, Fourier transform infrared (FTIR) spectroscopy, relative humidity sensors and distillation. Karl Fischer titration is the preferred test due to its accuracy and consistency. ASTM D6304 is currently the recommended method. Results are reported in parts per million (ppm) or percentage of water. For high-viscosity lubricants or formulas containing sulfur and other compounds, the test results will be more precise if a vaporizer is used to remove water from the sample. Water may also be dissolved in toluene. This additional step is known as co-distillation. Errors due to the presence of certain additives without vaporization may be 50-100 ppm. Of course, no laboratory test method is perfect, so some variability in the results can be expected. ASTM methods typically report the variability of each test in terms of repeatability and reproducibility. Karl Fischer titration is no exception. The results of this method generally are more precise and consistent for moisture concentrations greater than 100-200 ppm. It is important to note that ASTM 1744 (Standard Test for Determination of Water in Liquid Petroleum Products by Karl Fischer Reagent) has been discontinued as an approved test method since 2016. While this test was somewhat easier to manage, it was not as accurate. Still, some laboratories continue to utilize it. This technology has been employed to measure the moisture content of material in numerous industries for years. 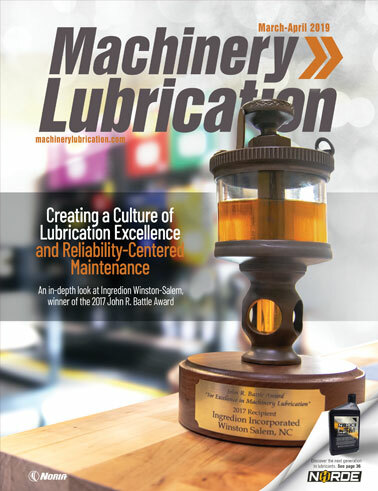 Recently, it was introduced to the lubrication field to monitor contaminants in lubricating oils and greases. It is supported by ASTM D7546 (Standard Test Method for Determination of Moisture in New and In-Service Lubricating Oils and Additives by Relative Humidity Sensor). Generally, an instrument heats a sample of test material and volatilizes the moisture, which is carried by a dry-air system through a sensor block containing the relative humidity (RH) sensor. Reagents are not used. The results are reported in ppm or percentage/micrograms of water. Studies on the method’s repeatability and reproducibility have not yet been completed. FTIR is a well-known and frequently used resource for lubricants. It can detect the presence of contaminants such as water, fuel and soot, as well as certain additives and oil degradation. While there are several ASTM methods related to FTIR and petroleum products, two are most relevant: ASTM E2412 and D7414. This quick, low-cost test can measure different parameters in oil or grease samples. One drawback is the lower detection limit, which is approximately 1,000 ppm. The results are reported in absorbance units for certain infrared-light wavenumbers. The laboratory may also provide the moisture concentration by percentage or in ppm. In the distillation process, water is extracted from the oil or petroleum product by heating the oil sample, which previously has been mixed with a solvent. The water is evaporated and collected in a trap. The minimum amount of water that can be measured is approximately 0.05-0.1 percent. The procedure should follow ASTM D95. This method does not require complex test equipment, but it is labor intensive, which makes it impractical for routine oil analysis. 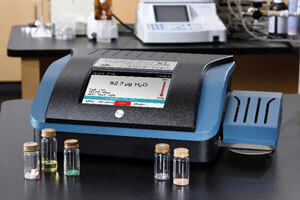 Relative humidity sensors, such as this moisture analyzer from Arizona Instrument, offer an alternative to Karl Fischer titration. Field lab analysis involves the use of portable instruments in a workshop or production facility. The technology is the same as that utilized in the laboratory but with a more compact device. Usually only a drop of oil is required, and results can be reported in minutes. Other oil parameters besides moisture content may be detected as well. Cost is the main downside with this approach. The calcium hydride kit is a common field test device. This test uses a reagent and a solvent (kerosene or toluene) to produce a reaction that generates gas from the existing water in the sample. It primarily measures emulsified and free water. Although low concentrations of water can be detected, this technology seems more reliable for concentrations greater than 150-200 ppm. The crackle test is another example of a popular field test. It utilizes two drops of oil on the surface of a hot plate to evaluate the presence of emulsified and free water. The minimum concentrations that can be detected are approximately 500-1,000 ppm. With this test, it is important to pay attention to any small bubbles or crackling noise. Multiple options are available for onsite infrared spectroscopy. Field inspections for water contamination are mainly visual. Moisture can be detected through a sight glass, bottom sediment and water bowl or oil sample. Keep in mind that only emulsified and free water can be seen, so if it is visible, the concentration is quite high. Establishing inspection routines and protocols as part of your monitoring program will be critical. Portable field test kits enable onsite oil analysis. Online sensors can be installed in circulation lines or reservoirs. They monitor water concentration directly by a saturation detector or through an indirect parameter such as the oil’s dielectric constant. This strategy may offer the best alternative in terms of early detection of contamination. Online or unattended sensors may also replace some routine oil analysis. For these reasons, there is an industry trend toward using this type of monitoring strategy. The purpose of an online sensor is to emit electrical signals that are responsive to changes in the physical or chemical properties of the fluid being monitored. Most sensors contain small electrodes that are immersed in the fluid. These electrodes generate electrical voltages and detect the oil’s response in terms of capacitance, resistance, dielectric constant or current. The measurements are correlated with known changes in the oil’s properties, such as water contamination, oxidation, cross-contamination with other fluids and wear debris. Some sensors have multiple measuring components, which allows monitoring of more than one property. Following are a few examples of these types of sensors currently available on the market. These sensors detect the dewpoint and percentage of saturation of dissolved water in oil. A water-permeable polymer is sandwiched between two flat electrodes to form a capacitor. Water penetrates the polymer to change the capacitance, which is used to measure the water-in-oil concentration. Refer to ASTM D7546 when utilizing this technology. These are the most commonly used sensors for moisture monitoring. There are also online water sensors that measure the total water content by percentage or in ppm. They are capable of assessing dissolved, emulsified and free water in the oil. These sensors provide similar information to known lab test results for water content. However, the resolution of the sensors that monitor total water content may not be as fine or precise as the ones used to monitor water saturation. This type of sensor measures an oil property that changes with oxidation, contamination or wear debris. Called dielectric constant or relative permittivity, this property is related to an oil’s capability to store an electric field. 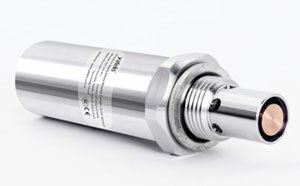 These sensors can detect changes in the oil’s condition due to degradation or contamination. They must be set up for the specific fluid conditions in which they will work. Impedance spectroscopy and other technologies are often employed with certain styles of these sensors. 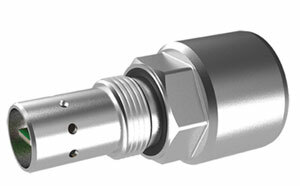 Multi-function sensors contain more than one measuring element to monitor up to three or four oil parameters, such as dielectric constant, saturation, temperature and conductivity. They may provide more comprehensive data about the fluid they are monitoring. Some even come with connectivity to report results wirelessly to a remote device or cellphone. While the use of online sensors is promising for the early detection of abnormal conditions and a reduction of labor, some challenges must still be overcome. It will be important for users to determine which oil properties or conditions they wish to monitor and to be somewhat familiar with the different options for monitoring these properties. Generally, sensors do not measure and report results like an oil analysis lab test. Most must be specified to the fluid they are monitoring. This requires comparing the sensor readings with the normal or abnormal conditions to be monitored in the oil. Laboratory support may be needed to correlate the sensor’s electric signal with specific oil parameters. Finally, remember that all sensors do not have the same resolution and accuracy, so get to know your sensor’s capabilities, applications and connectivity possibilities. By using online sensors, field tests, inspections and routine oil analysis, you can detect water contamination and take corrective action earlier with relatively low monitoring costs. While the options are vast, you should be able to find a strategy that best fits your budget and reliability goals.